I would like to share my experience regarding the on spot, emergency, instant acupressure treatment which relieves nausea and vomiting caused due to motion sickness otherwise called as travel sickness. My First experience and experiment was on myself I did after I learnt Acupressure subject in my 3rd year of BNYS at SDM college of Naturopathy and Yogic Sciences, Ujire, Karnataka. After my Exam Holidays I usually take a train travel from my native to Mangalore which was very comfortable night journey and from there a Two and a half hours travel to my college in bus early in the morning which was a very tough time I spent and that is the time I realised that I had travel sickness. The route had several bends, ups and downs then. So travelling in that route through bus with the empty stomach early in the morning was really difficult for me. I had severe Nausea (vomiting sensation) and vomiting. I tried to subside these sensations using simple methods like sipping small amount of water, smelling lemon, eating some chocolates and mints, etc., But they all had very little effect on me. 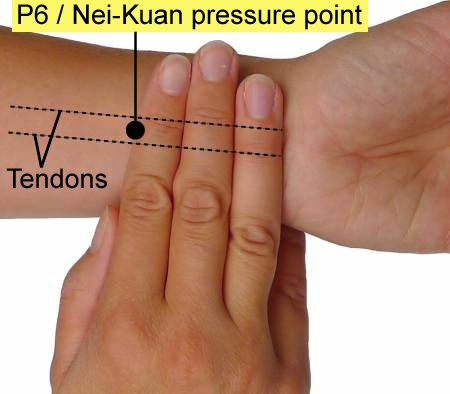 Finally I remembered my Teacher’s Teaching regarding the Effective Acupressure point for this condition P6 (Neiguan) first three fingers from the distal wrist crease. It is a self applicable treatment and most beneficial pressure point which instantly relieved me from my unpleasant sensation and made me feel comfortable and fresh till I reached my college. After this incident I started to practice only this technique during my Travel. My next experience was with a 5 year girl during my travel from Dharmasthala to Subramaniya in the bus. When Me with My family were having some biscuits we wished to share with a 5 year kid also who was accompanying with us near our seat. But the mother of the kid told us not to give her because she had travelling sickness problem and would tend to vomit out. I felt sad on that girl and told her mother not to feel bad. I just used the Acupressure point for her which I used to experience for myself for the same difficulty and then gave her the biscuit to eat. For the mother’s surprise the kid didn’t have any vomiting sensation or didn’t vomit. That was surprising for even my parents and were very happy. This was really a miraculous experience for me and I really got complete confidence on my system and feel proud about my system, my Beloved Teachers and My college. I heart fully thank my teachers who taught me this great art, science and the way of life system. I also request all my dear friends going through this post can confidently try this point and get benefited when you or your friends face the problem.